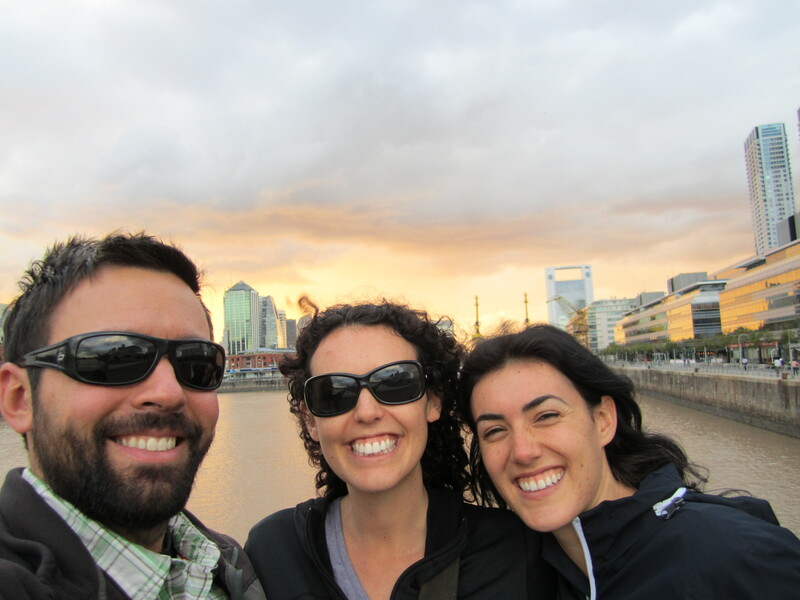 We ended up spending more time in Buenos Aires than any other city on this trip. We rented an apartment and just hung out for two weeks. It was nice to relax a bit after nine months of constant traveling and we really enjoyed having all the facilities of home in our apartment. Kristen’s youngest sister, Bridget, met up with us after one week there, and it was a good introduction for Bridget about the ways of Argentina. 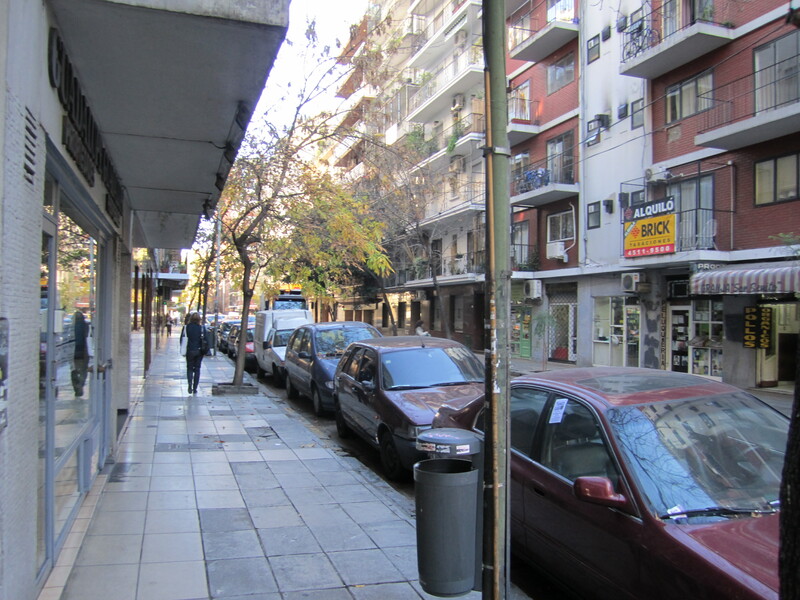 We found our apartment through BYT (www.bytargentina.com), and stayed in the Palermo neighborhood. We scored a two bedroom place for about $420 per week. 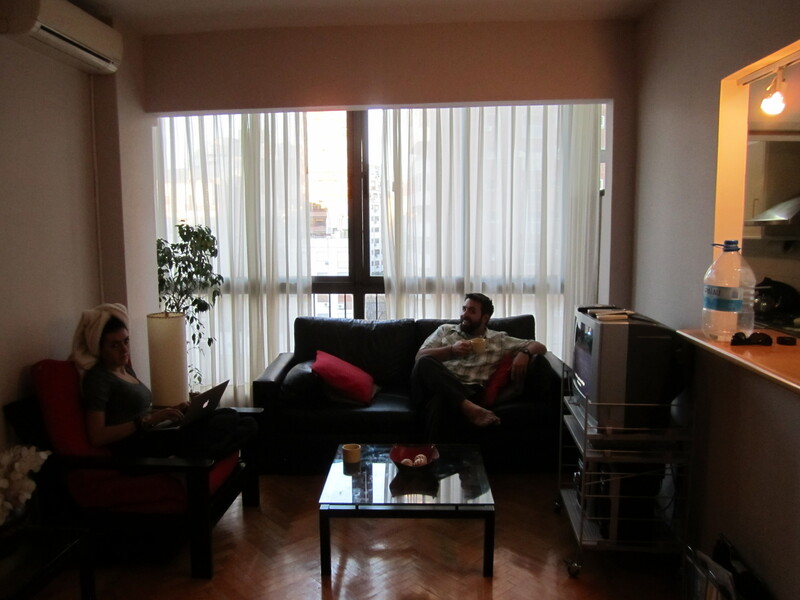 Not the greatest picture, but here we are hanging out in our apartment. 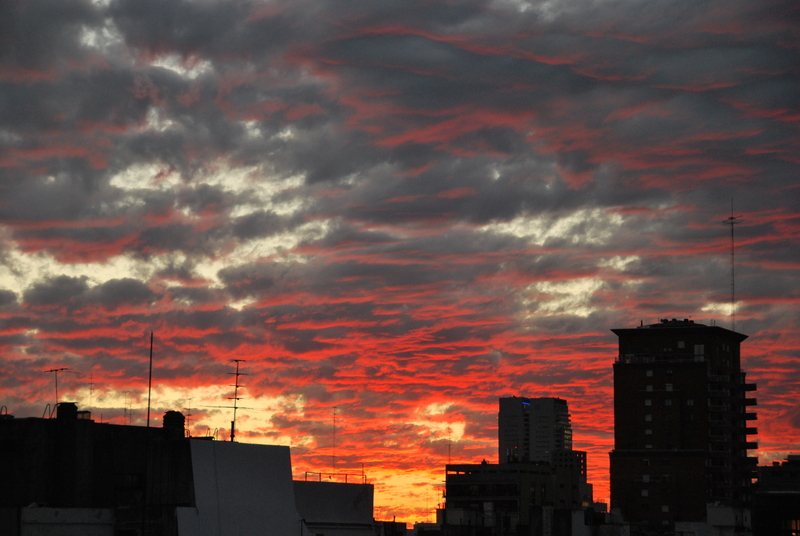 Insane sunset view from our living room. We loved the neighborhood as well. It was not touristy at all, and it had great amenities nearby. We loved being able to cook our own meals, and we made daily trips to the small market across the street and, of course, to the fruit stand. Bridget buying fruit from our favorite stand. We enjoyed walking along the old port which has now been turned in to a great place for a stroll. They have kept the historical look to this place, but the buildings now serve very different purposes than originally intended. 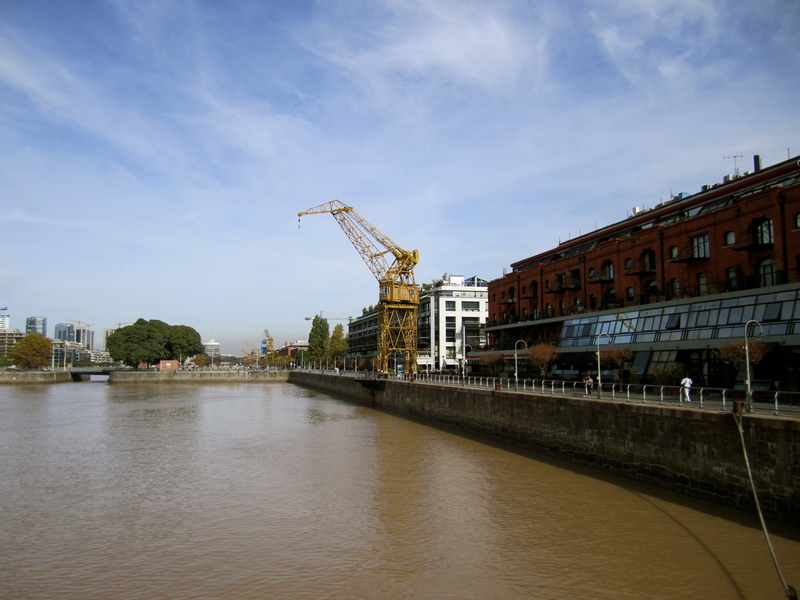 The storehouses are used as restaurants and shops, and the nonfunctioning cranes act more like large sculptures. No more ships…. just lots of walkers. 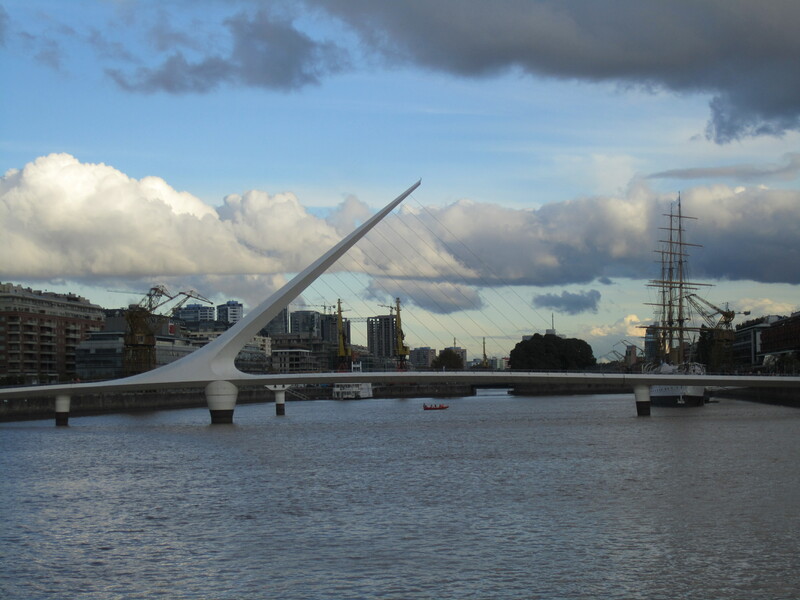 We liked the ultramodern structure of this bridge mixed in with all the old history. Permanently parked along the riverfront, there is an old navy training ship that is now a museum. Of course we couldn’t resist the chance to check it out, and it actually ended up being only 50 cents to enter… the cheapest entrance fee we have paid in all of Argentina! 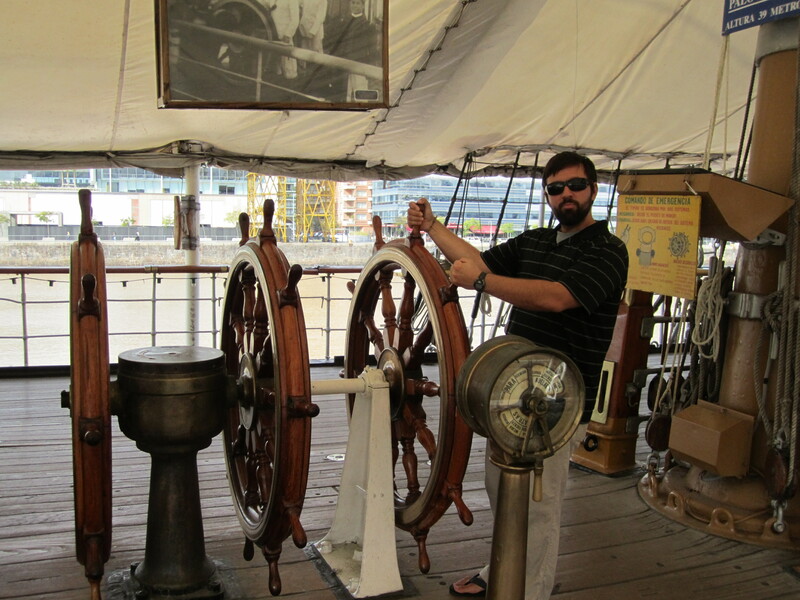 The ship was full of historical pictures and information from its training voyages in the early 1900’s. With Joe at the helm, no one needs to worry! 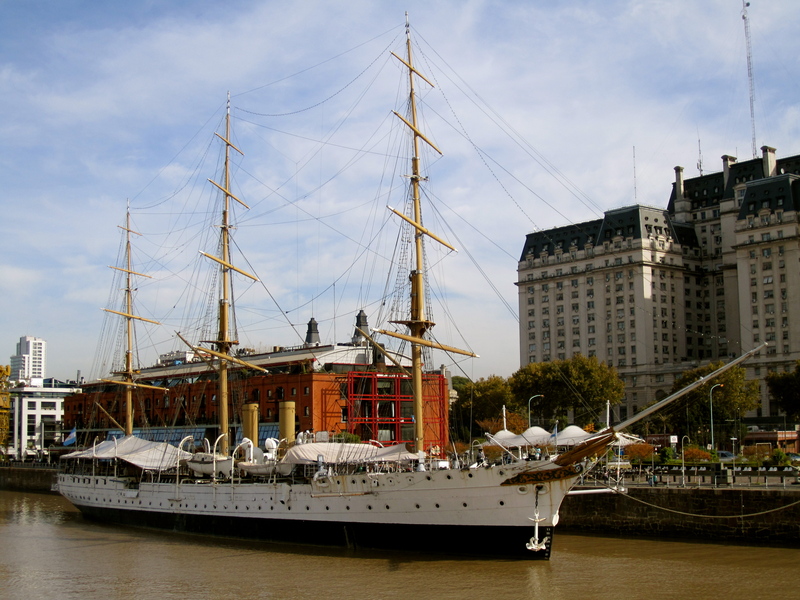 In addition to the naval museum visited in Puerto Madryn, BA has heaps of museums to explore. Although we aren’t normally museum people, we checked out a few. 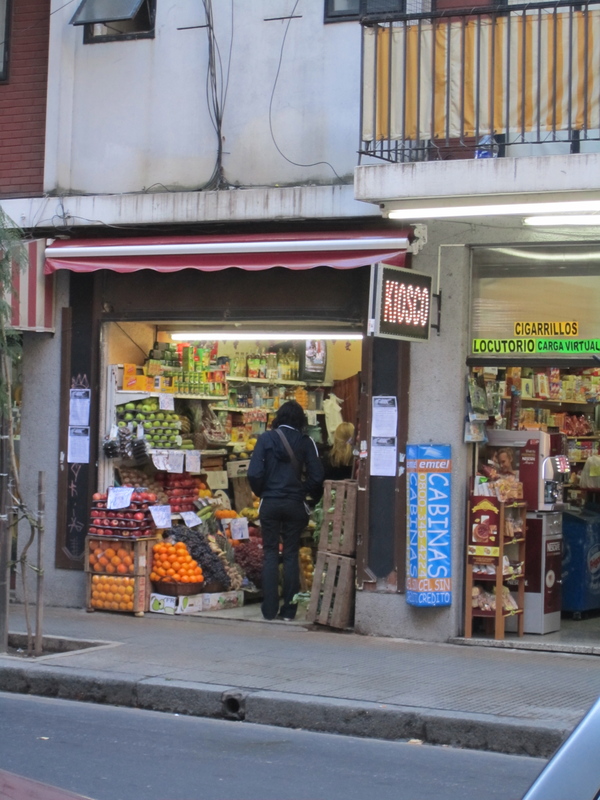 – Modern Art in San Telmo: Luckily this was another 50 cent entrance fee, because we just don’t “get” modern art. 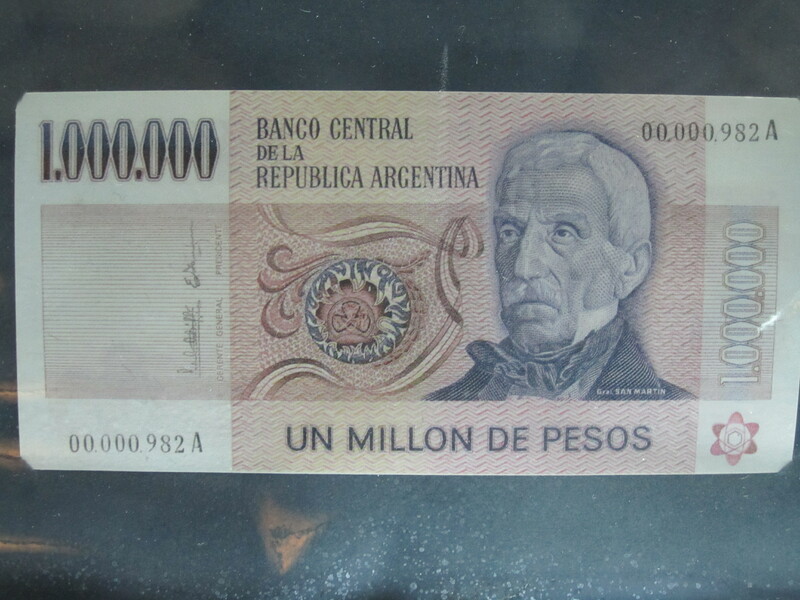 – Museo Histórico Dr Arturo Jáuretche: This is an interesting museum about the financial history in Argentina, which seems to have always been quite turbulent. 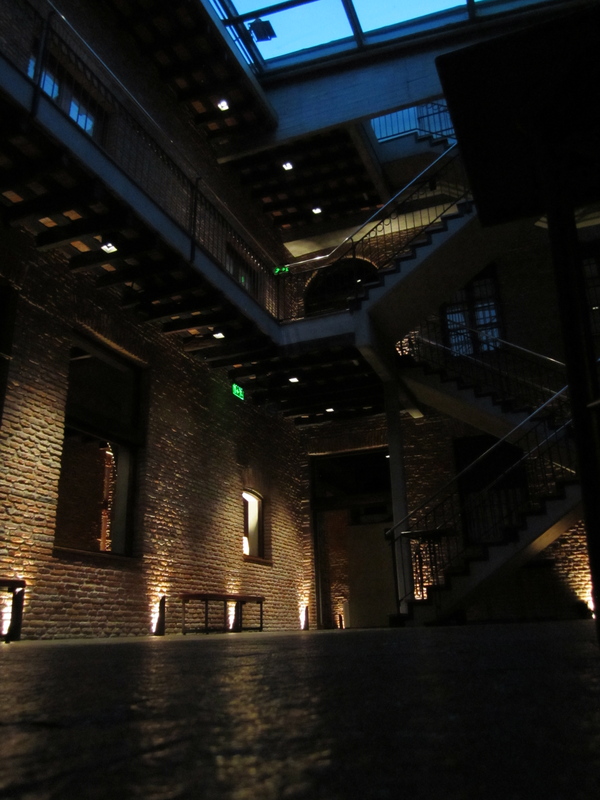 It was a free visit and is located in a “Wall Street-like” neighborhood. 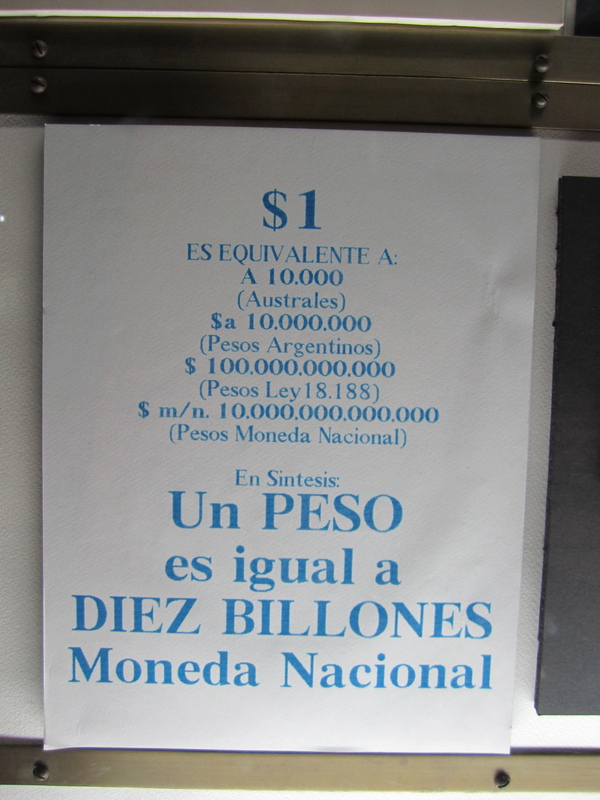 They have revalued their currency several times in recent history, and it was fun to look over all the displays. Wish we had this bill right about now. Our favorite sign showing all the different money transitions over the years. Sidenote: We decided to visit this museum because money is such a funny joke in this country. Their bills are seriously falling apart and almost always ripped and torn, but if you give them an American bill with even the slightest bit of writing on it, they will not accept it. Also, good luck finding coins in this country. Everyone always asks you for exact change, but NO ONE ever has it! 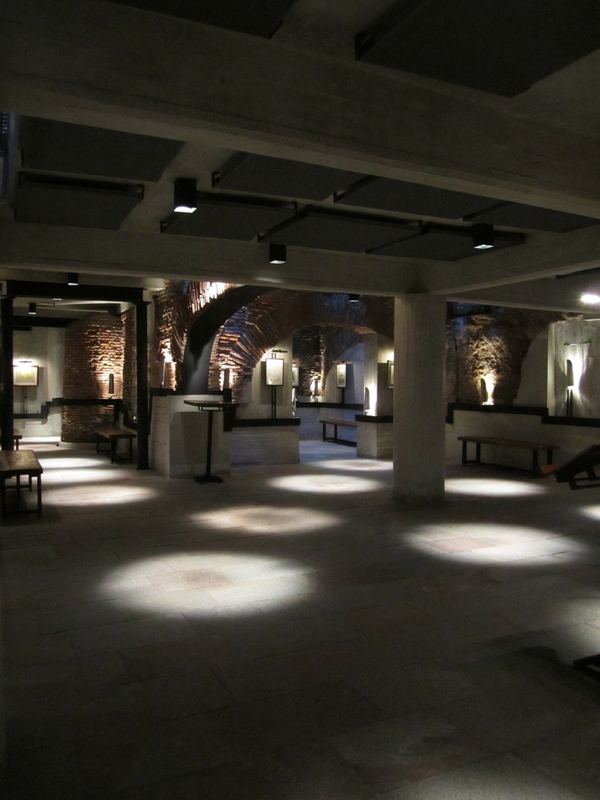 – El Zanjón: Here we got a tour of a historial mansion and the tunnels that were discovered underneath it. 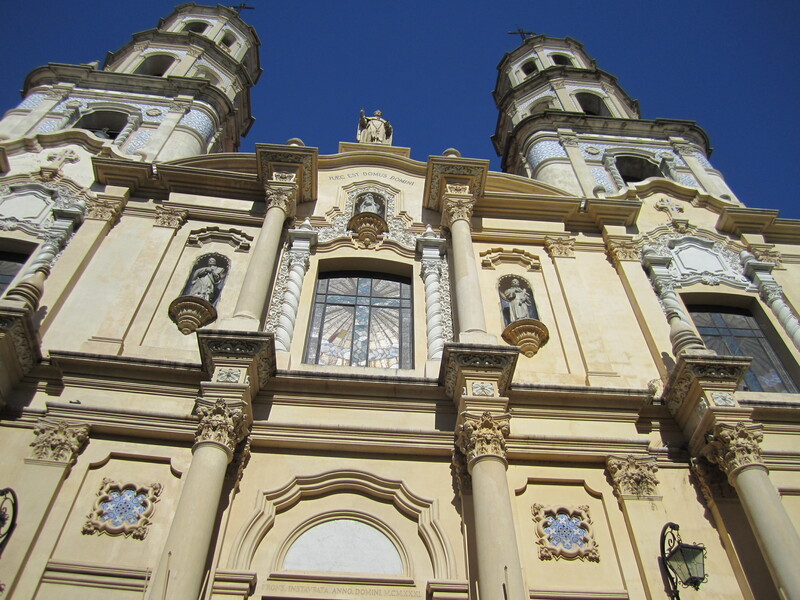 It is beautifully reconstructed, but we might be fuzzy on most of the details because we were too cheap to shell out the extra money for the tour in English. 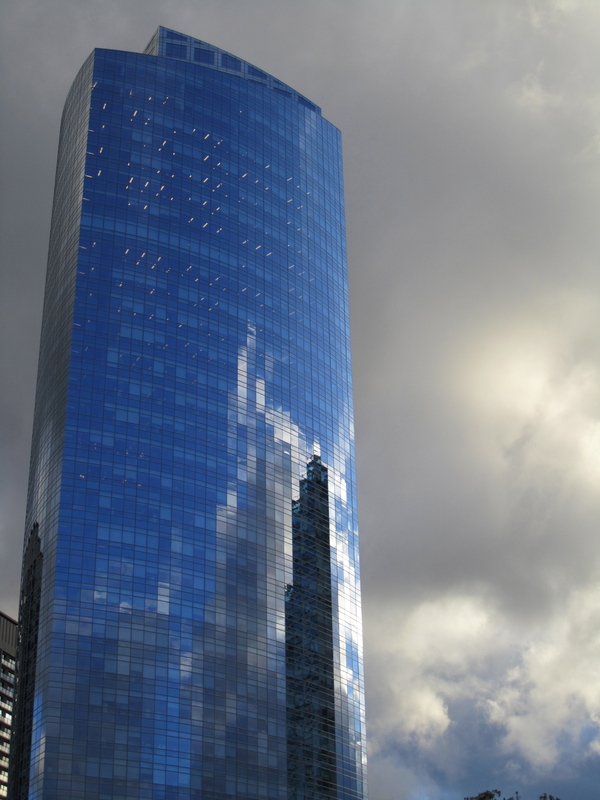 BA has a bit of everything when it comes to buildings. It makes it very fun just to wander the streets in awe. 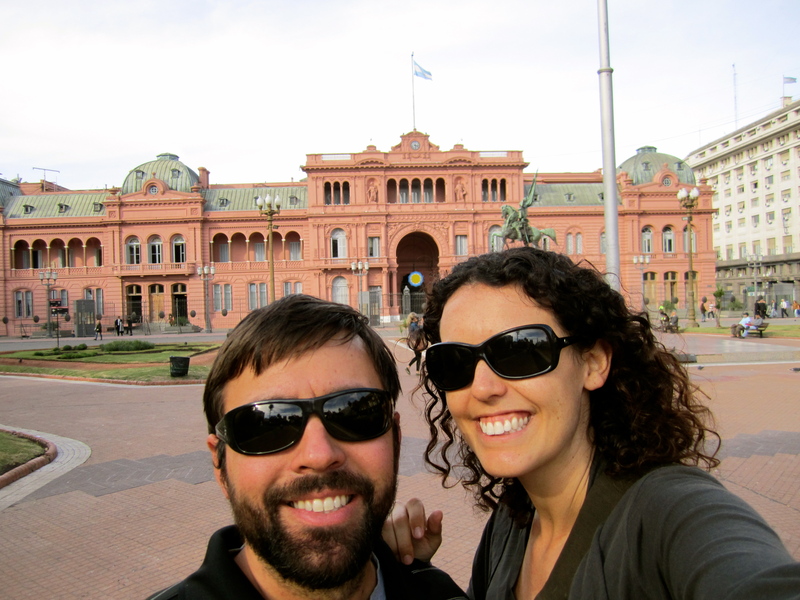 Casa Rosada: The “Don’t Cry for me, Argentina” building. 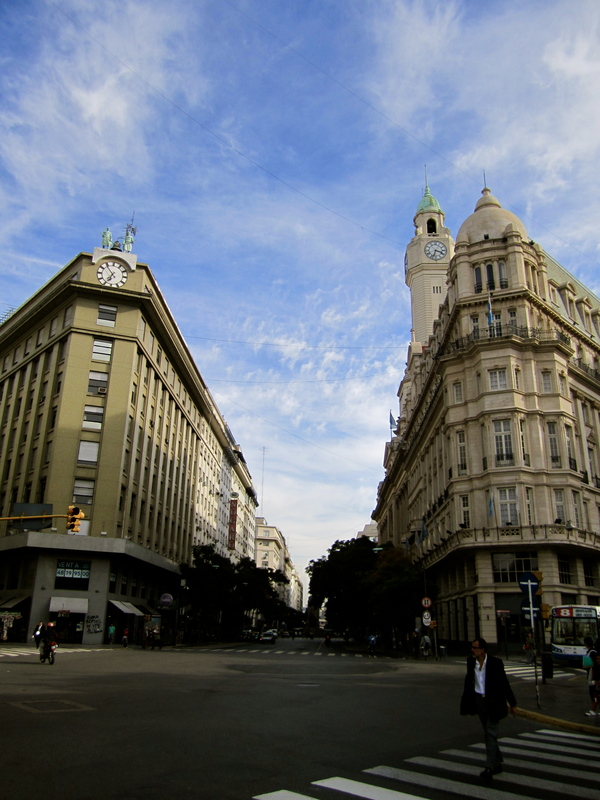 Just another street in Buenos Aires. A little new and old intertwined. 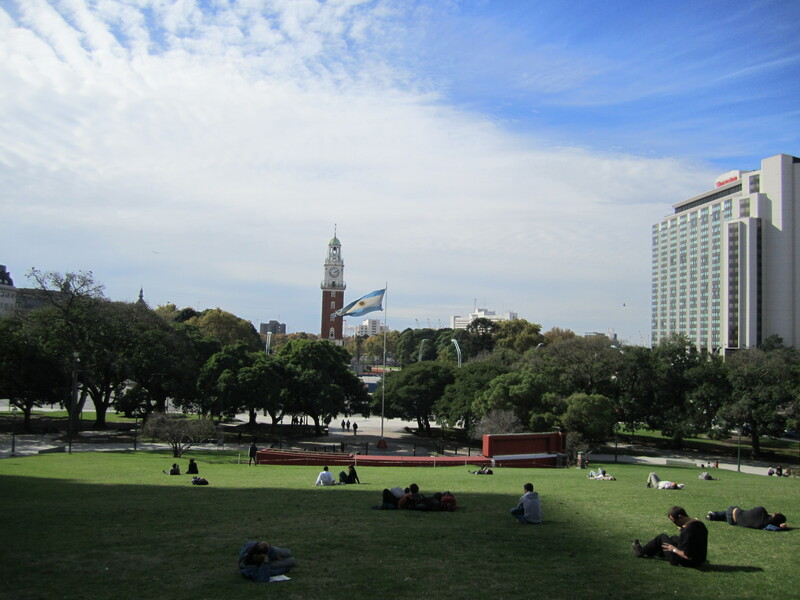 Open green spaces abound in this large city, and sitting in a park, people watching, while soaking up the sun was one of our favorite ways to pass the time. Bridget enjoying the changing leaves. 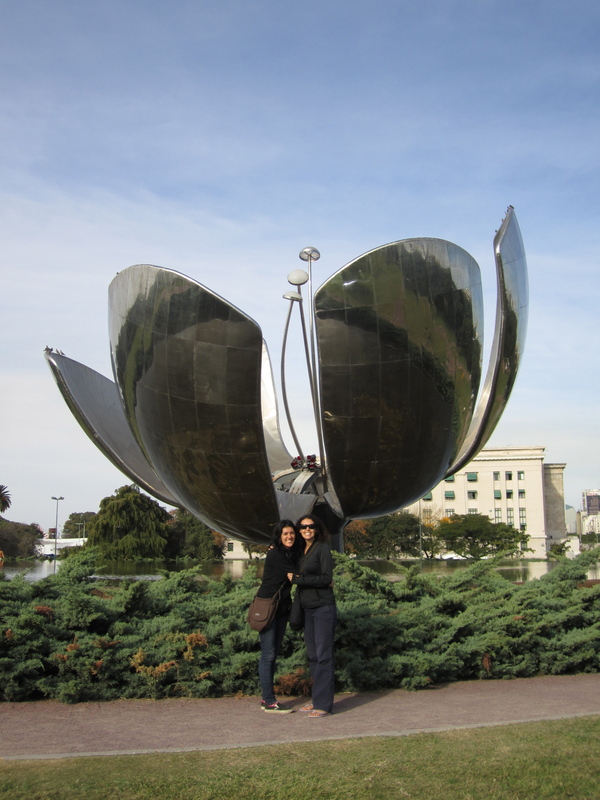 Floralis Generica (or the “Big Metal Flower”): It is supposed to open and close with the sun, but it is currently broken. 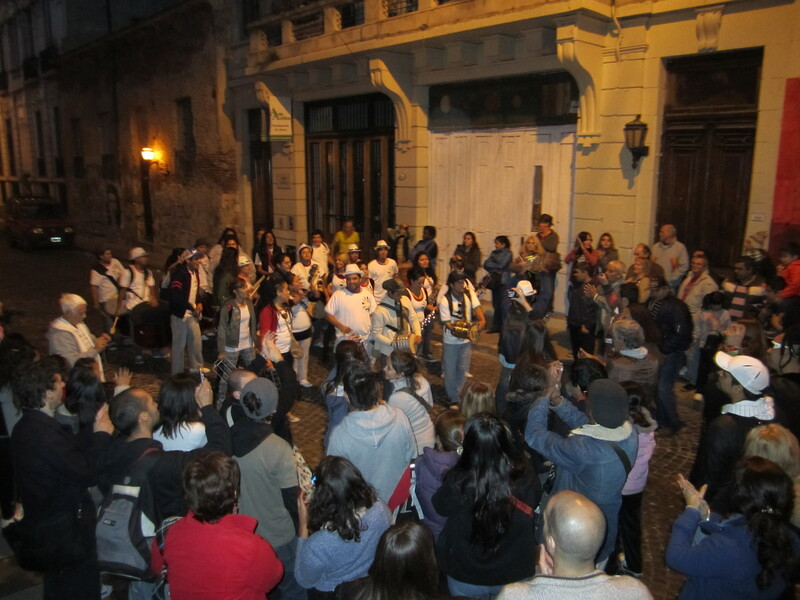 It seems that you can’t be an Argentinian unless you can play some sort of musical instrument. Often you find yourself caught up in one musical performance or another. 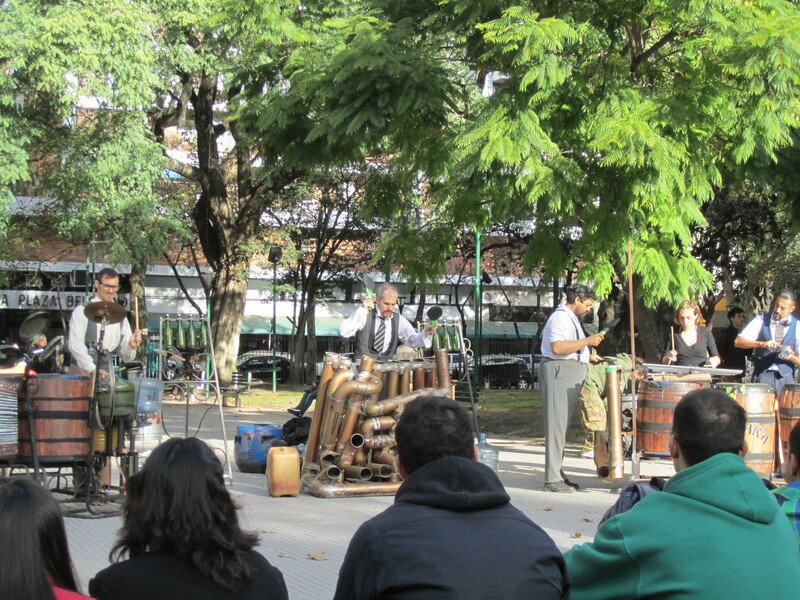 Listening to La Urraka perform in a park with instruments they created. An insanely good act. A drumming group face off/ impromptu parade. BA really seems to be at its best during the weekends, when the parks and streets fill with people, vendors, and music. We (much to Joe’s excitement) planned our schedule to fit in as much market time as possible. You can buy just about everything from these places, from the usual souvenirs, to hand crafted goods, to antiques. 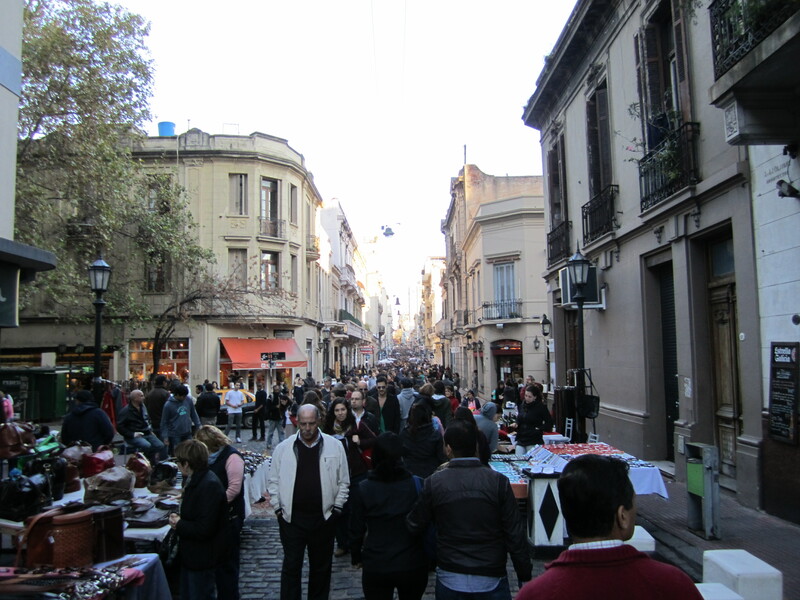 Sunday Market in San Telmo. 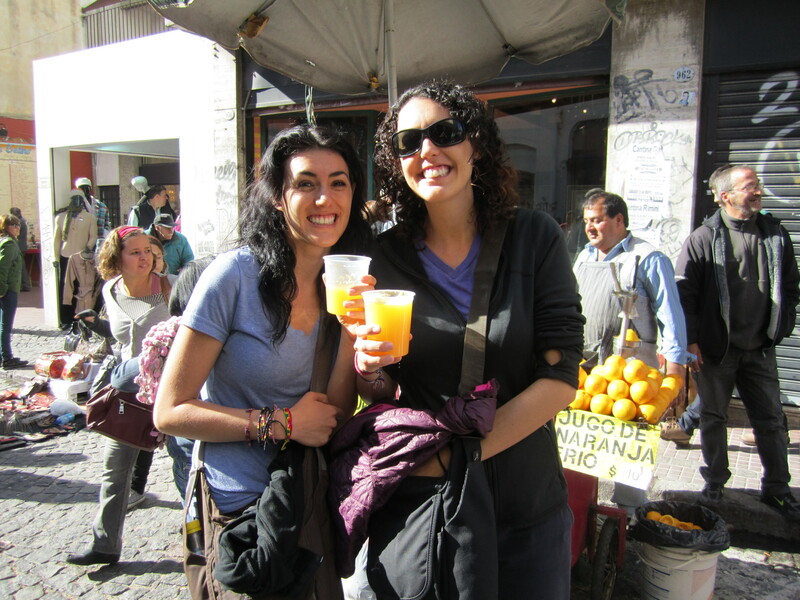 Enjoying some fresh squeezed orange juice… not quite as cheap as in Bolivia, but still delicious. 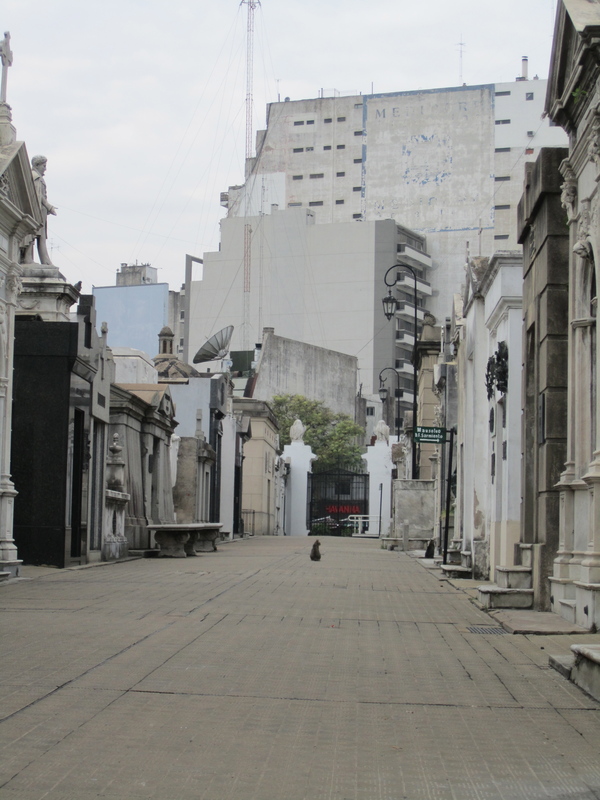 When we were told over and over to make sure to visit the cemetery, we always agreed but wondered what all the fuss was about. 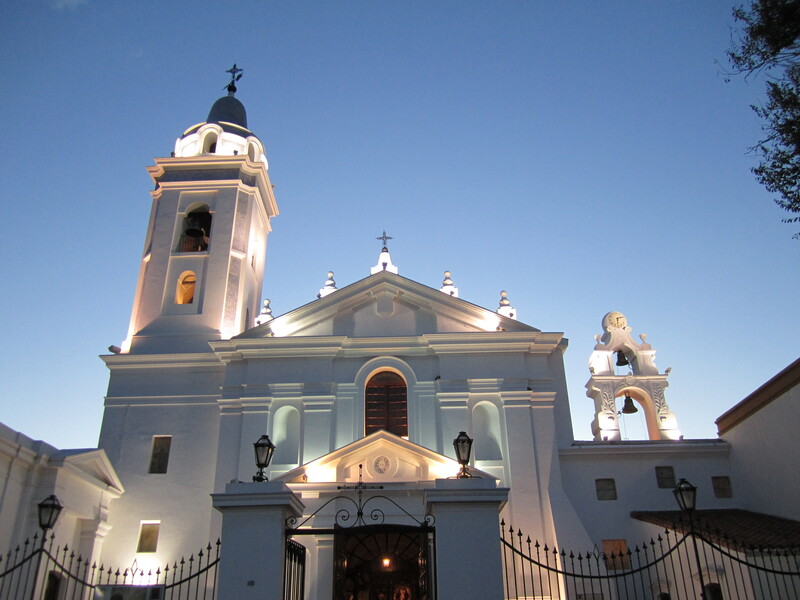 Cemeteries usually aren’t on our list of must sees, but this one is different. Started in the early 1800s, this cemetery was “the place” for the BA elite to be buried. 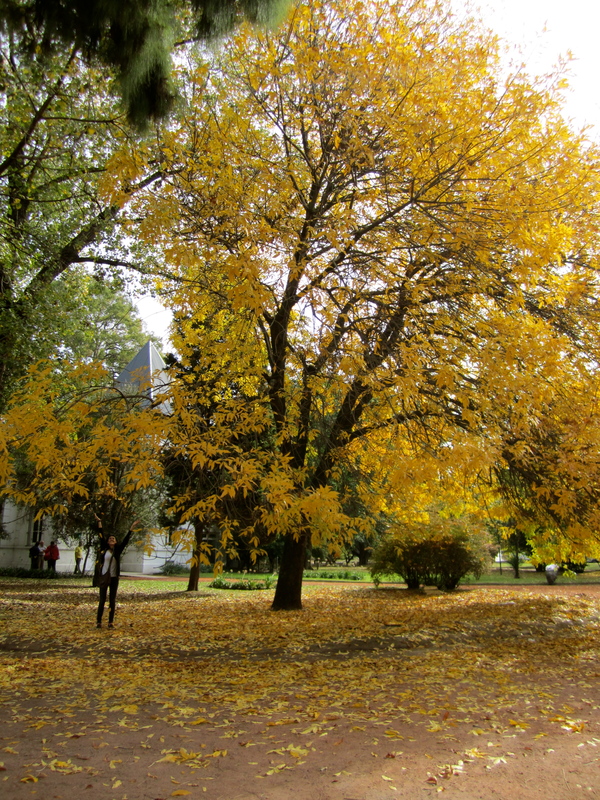 Most of the mausoleums are in pretty good shape, and the area is a peaceful and beautiful walk. 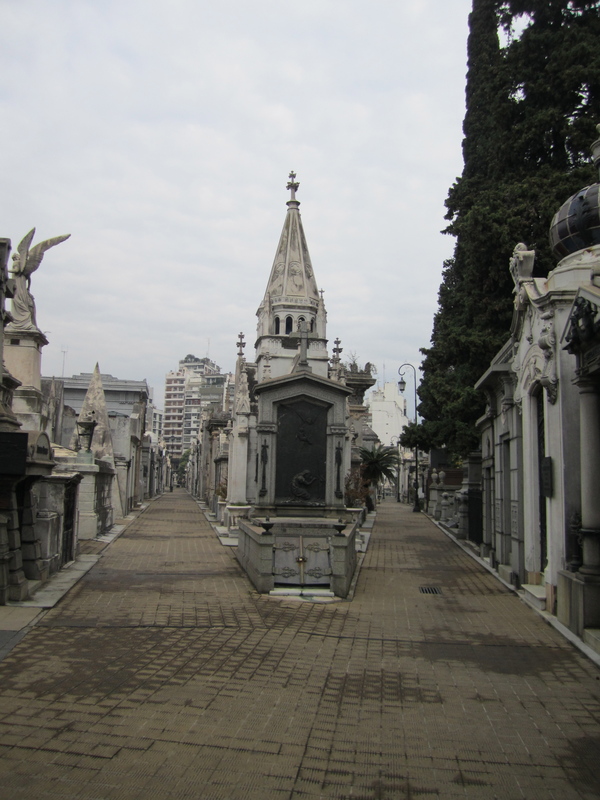 There are also quite a few famous Argentinians buried here. 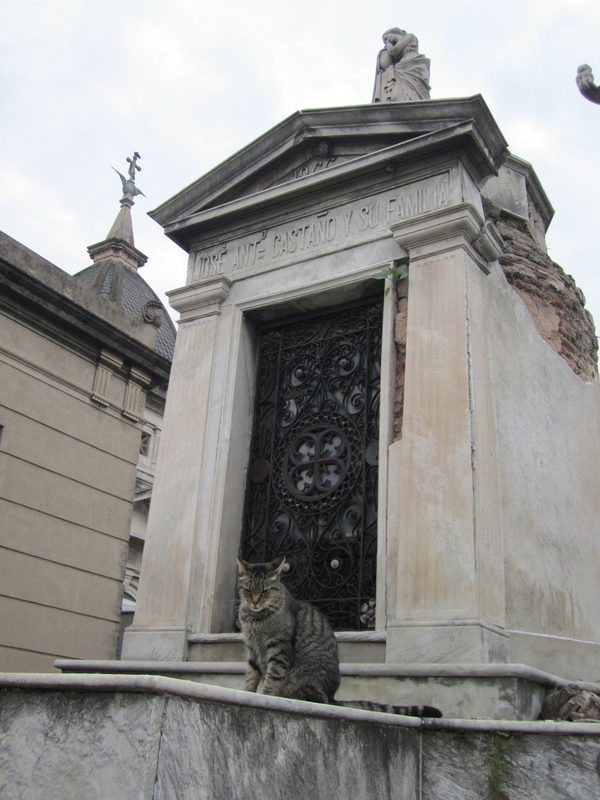 One of the cemetery’s many resident cats “guarding” an entrance. A peaceful place despite the fact that it is a huge tourist attraction. 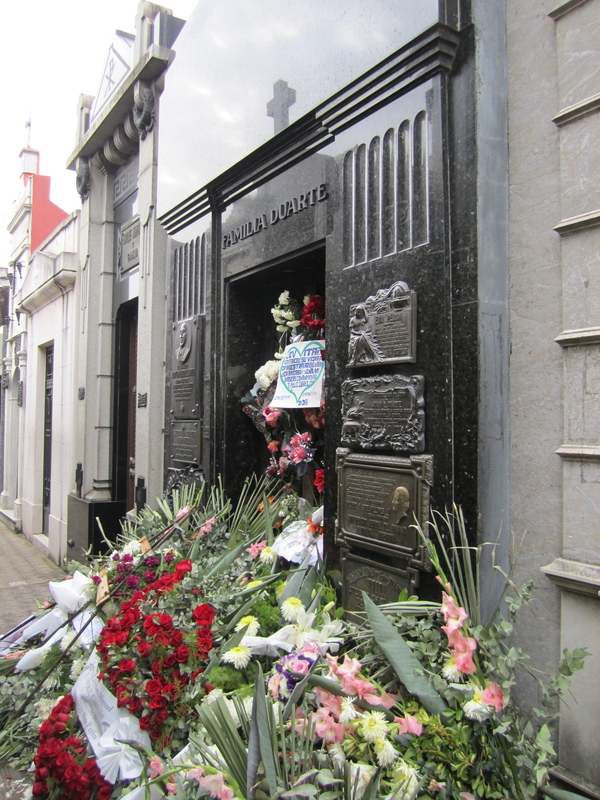 Eva Perón’s grave. Argentinians still love her after all these years. 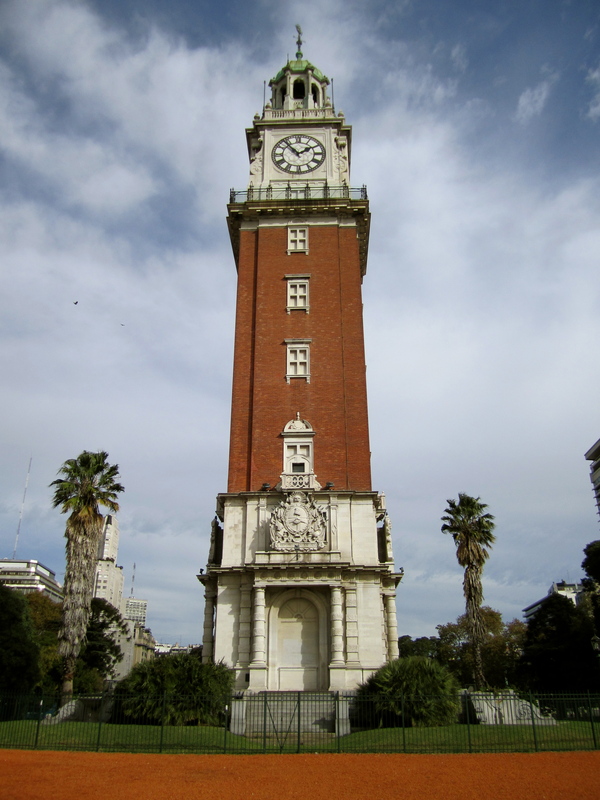 Although I’m sure that Argentina would like to forget it’s dark past, there is a group of women (and others) that won’t let the loss of their loved ones be forgotten. 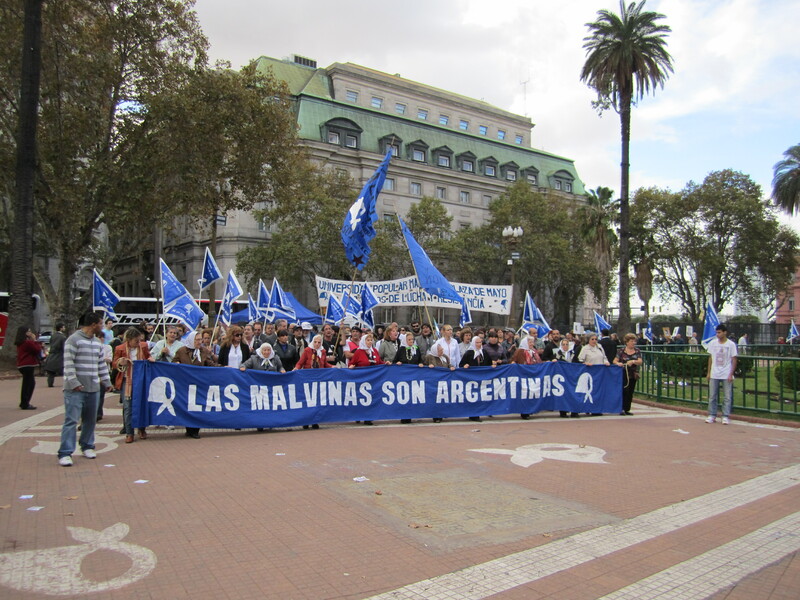 During the late 70’s and early 80’s, Argentina’s government tried to crack down on dissenters. During this “Dirty War,” thousands of people were kidnapped and tortured, simply for speaking out against the government. Many never returned and are presumed dead. 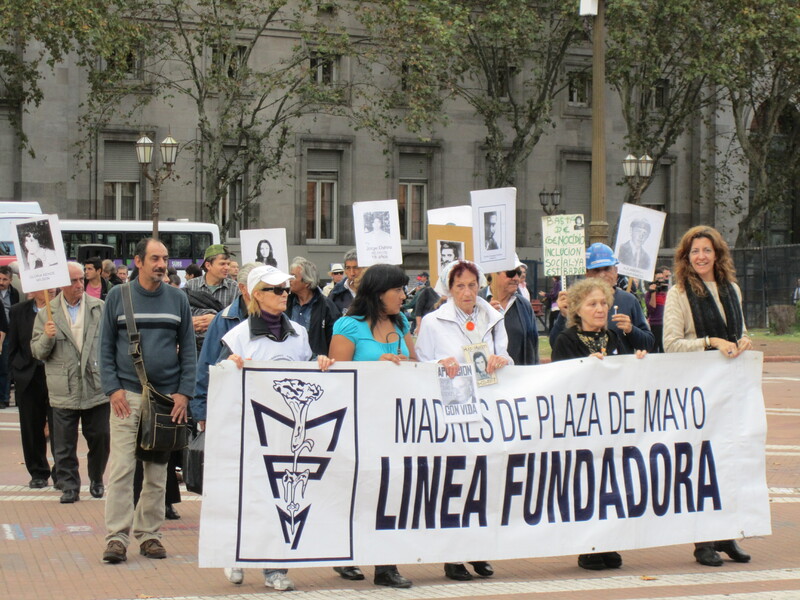 In 1977, a group of mothers banded together and marched on the Plaza del Mayo in front of the presidential palace to demand answers as to where their children were. Since then, this group has met every Thursday on the Plaza to march in hopes of finally getting answers, and so that people never forget what happened. We happened upon the plaza one Thursday afternoon, and it was heartbreaking to see these women, many of whom are now quite elderly, march around the plaza wearing their traditional white scarves and holding pictures of their missing loved ones. It is hard to imagine that these women have been here every week for over thirty years. 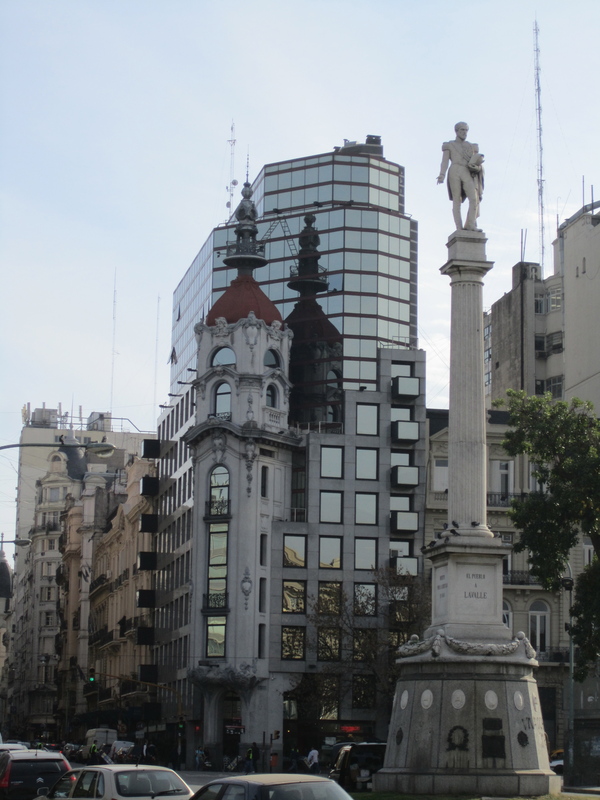 Buenos Aires is a great city. Just like all big cities, it is hard to truly get a feel for it unless you are there for a long time. Although we spent two weeks there, we feel like we barely scratched the surface. Maybe that means that we’ll just have to return one day. So happy to see you all having so much fun. My oldest daughter, my youngest daughter and my favorite son-in-law all hanging out together. Awesome! Also, was that a LADDER I saw connecting the old steeple-type building to the modern one? What is the entrance fee for that feat?! That fruit stand looks awesome. I inspected the oranges on zoom, and they all looked to be in perfect shape. 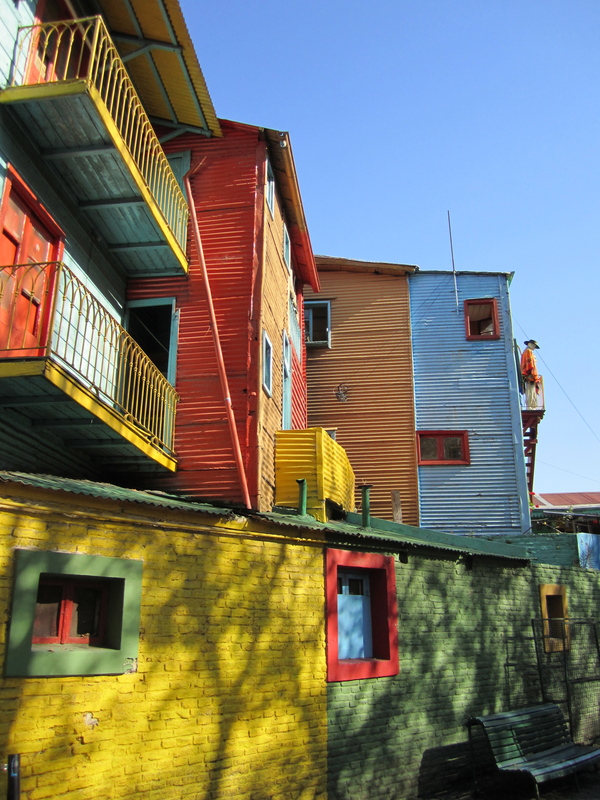 Next on the bucket list: Argentina.